East on Hwy 24 to Calhan. North on Calhan Highway (this is Yoder road on the street sign) which is one of the last streets in town. (There is a sign that points to the airport, this is the road!) Drive 7 1/2 miles, you’ll come off pavement and your next left will be Road 78. Turn left and drive 3/4 mile to the entrance of the club. You’ll see the stone clubhouse and a hot cup of coffee will be waiting for you. 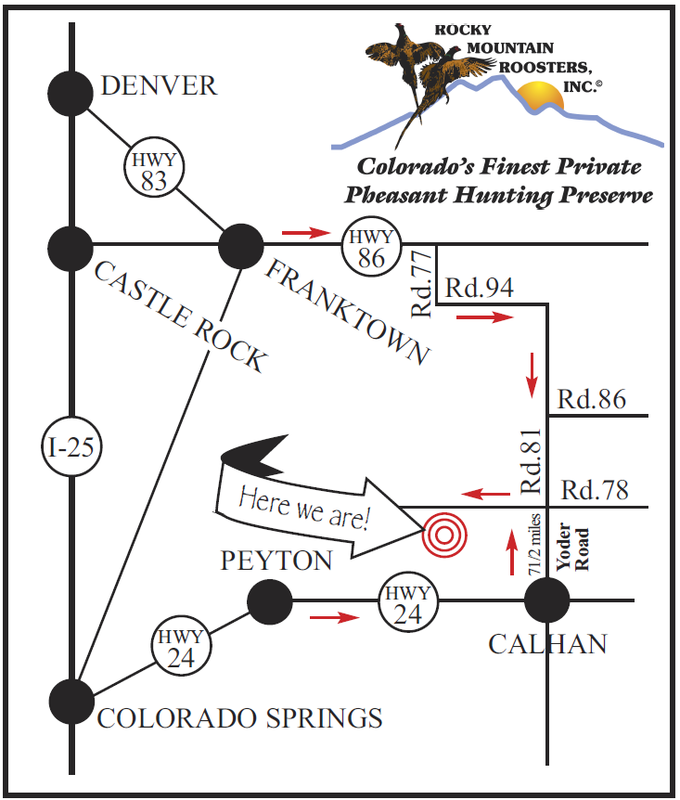 Fantastic Pheasant hunting in Colorado awaits you here! South on I-25 to the Founders Parkway exit just north of Castle Rock. (This is where the Factory Outlet stores are) East on the parkway to the intersection of Hwy 86. Continue east on Hwy 86 past the town of Kiowa 8 1/2 miles and you’ll see a sign that points to Calhan, this is Road 77. Drive south on Road 77 to the “T” intersection, turn left on Road 94 and follow it around and it turns into Road 81. Continue south on Road 81 to Road 78, turn right and we are at the bottom of the hill. (About 10 miles from Hwy 86.) Colorado Pheasant Hunting at its finest!